St. Bernard Vineyard, Stawell. (Victoria). 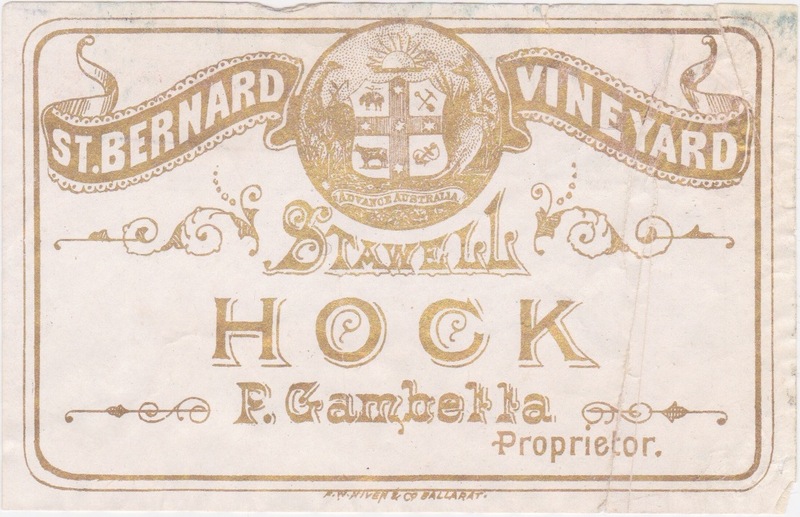 P. Gambetta, St Bernard Vineyard, Stawell. The original label above was part of a group of labels that had been in a printers sample folder from Niven & Co, Ballarat. The various labels dated from the late 1880s to about 1903 and the Federation promoting Australian Coat of Arms on this one put it firmly in the 1890s to early 1900s period. On first glance the name of the proprietor appears to be Gambella but further research confirms that Peter Gambetta was the vigneron in question. From the Horsham Times, Tuesday 9th June 1931, Page 4.